Amy framed this wall hanging in a white frame with a yellow mat for her sewing studio. It would be great for a gift for a sewing sister too! 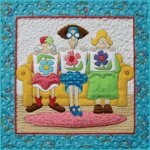 The 1 Little 2 Little 3 Little Quilters pattern includes instructions and full-sized patterns to make this 24 1/2" x 24 1/2" wall hanging.